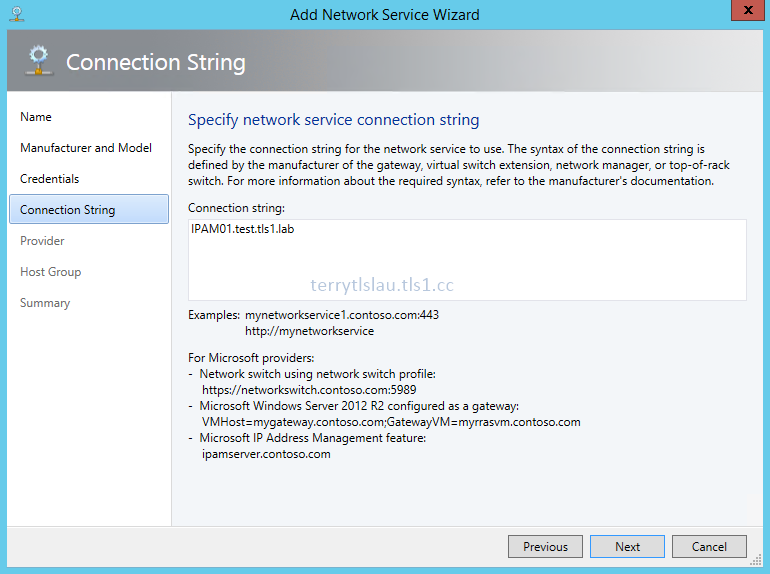 In System Center Virtual Machine Manager (VMM) 2012 R2, administrators can add an IPAM server which is deployed in Windows Server 2012 R2 to manage and monitor IP address. 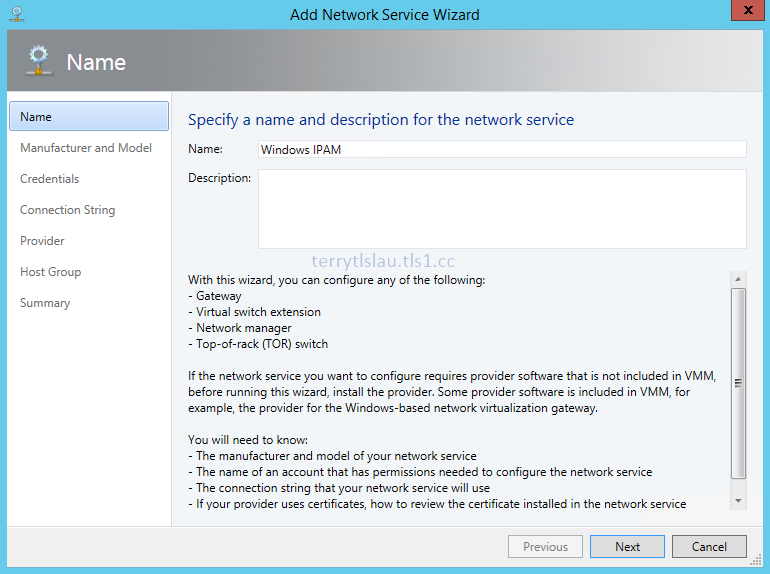 I will set up a lab to add an IPAM server to a System Center Virtual Machine Manager (VMM) 2012 R2 environment. 1. On IPAM01, log in as Domain Administrator. 3. Expand "Computer Management > Local Users and Groups > Groups". 4. 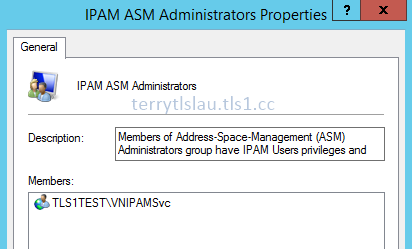 Add "VNIPAMSvc" into "Remote Management Users" and "IPAM SAM Administrators". 5. 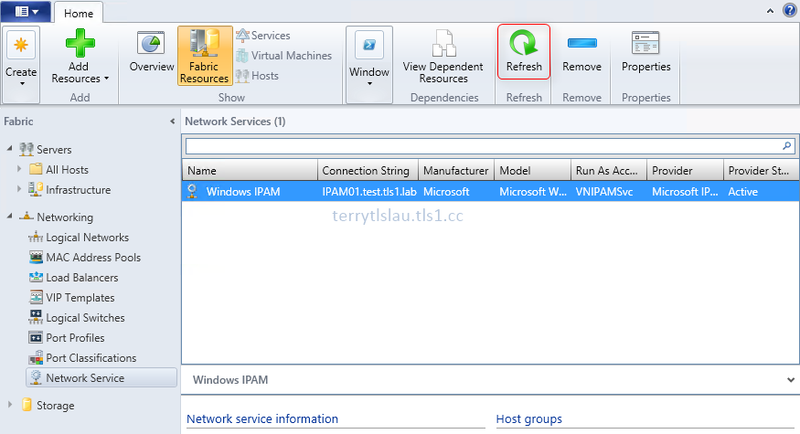 Make sure the IPAM server and the VMM are being kept in time synchrony. Basically, the two servers are in the same forest, Windows Time Services of domain members synchronize the time form domain controllers. If the time isn't in time synchrony, administrators can perform "W32tm /resync" in a command prompt. 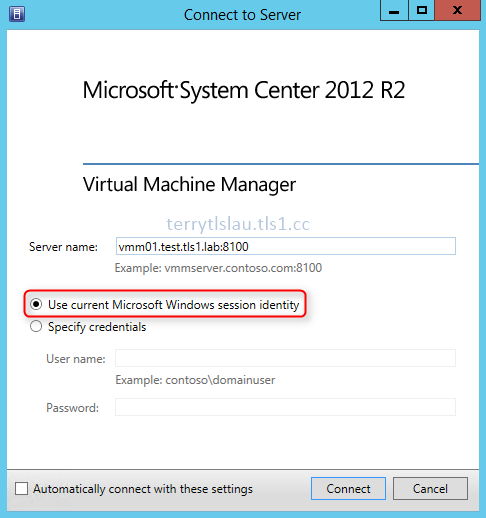 Remark: If you cannot control the time synchrony of the IPAM server and the VMM server as described in the Prerequisites in this topic, you must update permissions on the IPAM server so that the provider software (included in VMM in System Center 2012 R2) can query the current time setting on the IPAM server. 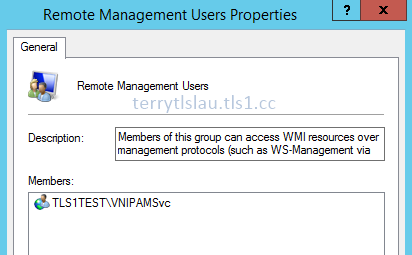 To do this, on the IPAM server, run "wmimgmt.msc" to open the WMI Control (Local) snap-in. Right-click "WMI Control (Local)", click "Properties", and then click the "Security" tab. 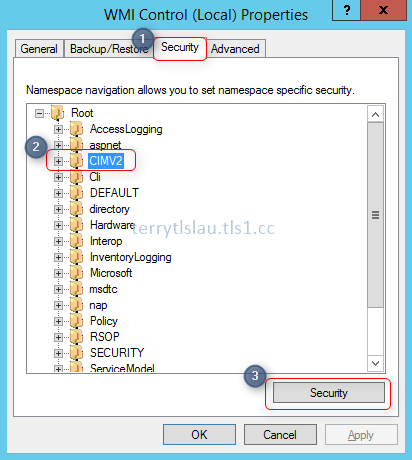 Navigate to "Root\CIMV2", click the "Security" button, select the account that you created for the Prerequisites in this topic, and then for "Remote Enable", select the "Allow" box. 6. Go to VMM01, log in as VMM administrator. 7. Launch "Virtual Machine Manager Console". 8. Log in with "Use current Microsoft Windows session identity". 9. On "Virtual Machine Manager" console, select "Fabric". 11. On the "Home" menu, click "Add Resources > Network Service". 12. On "Name" window, next to "Name", enter "Windows IPAM". 14. 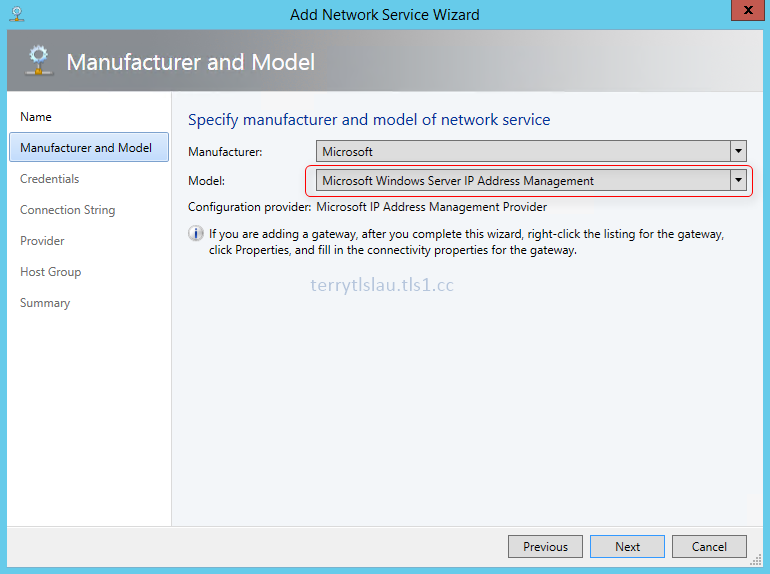 On "Manufacturer and Model" window, next to "Model", select "Microsoft Windows Server IP Address Management". 16. On "Credentials" window, click "Browse". 17. 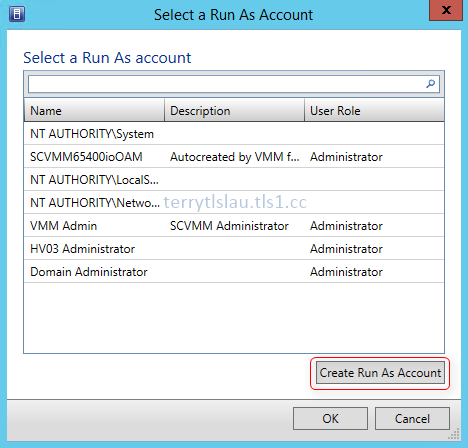 On "Select a Run As Account" window, click "Create Run As Account". 18. 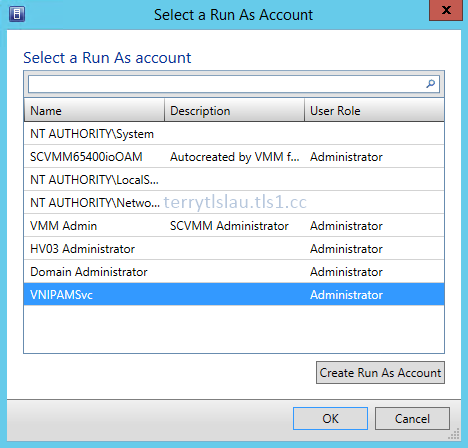 On "Create Run As Account" window, enter the "Name", "User name" and "Password" of "VNIPAMSvc". 20. Select "VNIPAMSvc", click "OK". 21. On "Credentials" window, click "Next". 22. On "Connection String" window, next to "Connection string", enter the IPAM server name "IPAM01.test.tls1.lab". 24. 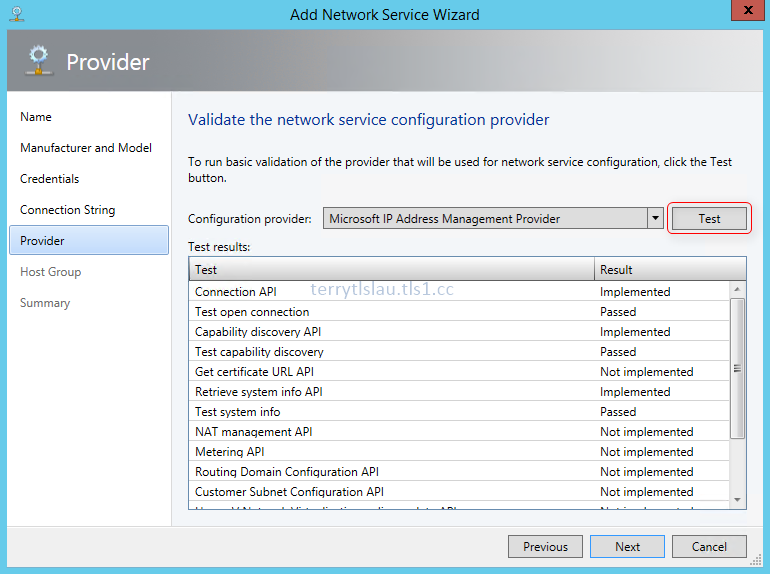 On "Provider" window, next to "Configuration provider", click "Test". 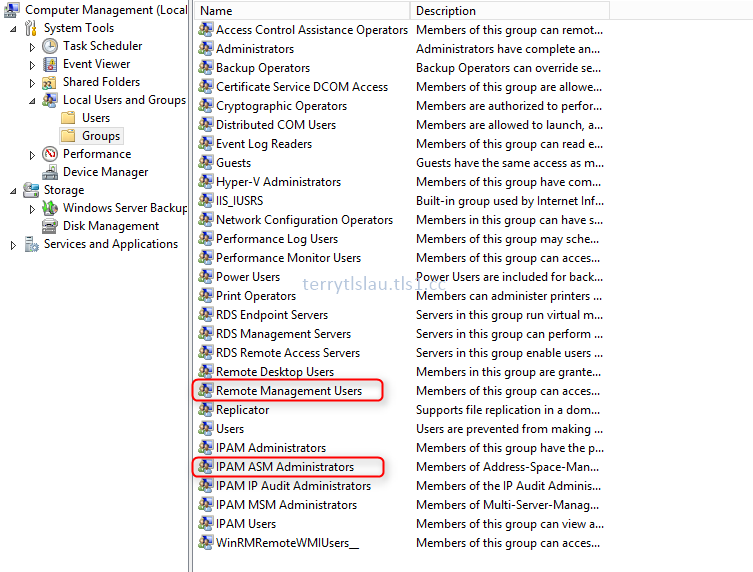 If administrators grant sufficient permissions for the service account, "Test open connection", "Test capability discovery" and "Test system info" are "Passed". Results that say "Implemented" and "Not implemented" are informational only, and indicate whether the provider supports a particular API. 26. On "Host Group" window, check "All Hosts". 28. On "Summary" window, click "Finish". 29. 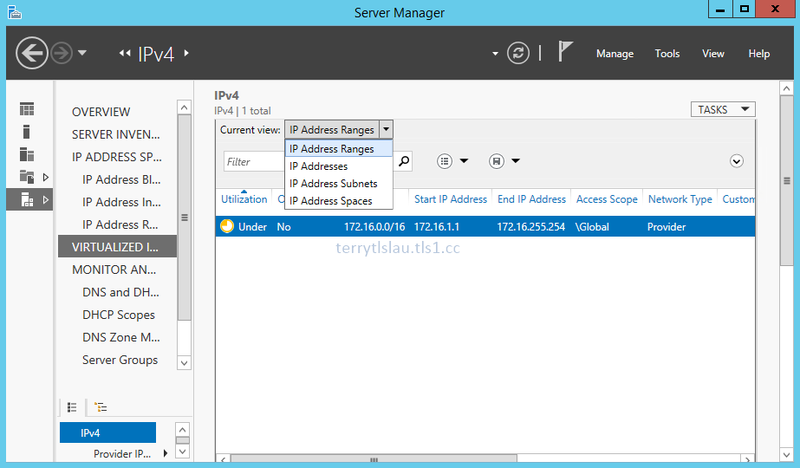 Administrators can press "Refresh" to send or receive the settings to IPAM server. As a result, the IP address information of "Virtualized IP address space" displayed in IPAM server. 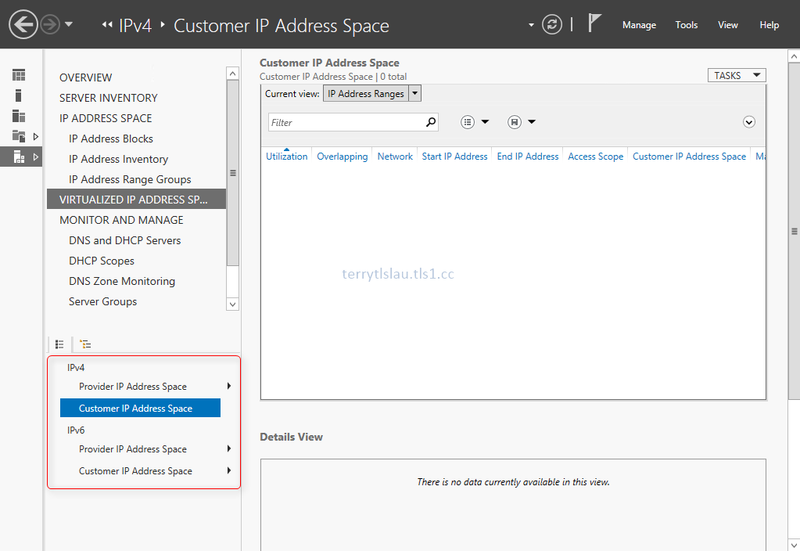 Administrators can manage "Provider IP Address Space" and "Customer IP Address Space" for VMM in IPAM.